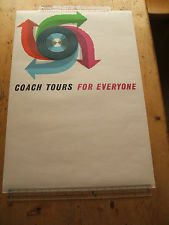 Half way bus tour : coach class – 365posterblog. Moving on to the second part of a Bromfield hat trick. Now nice as they are, there is a problem because of the message space they are only half there ! How to display ? do you ruin the poster by writing a message to your loved one ? (suggestions please) or do you display it half mast. A choice that I would imagine leaves them folded up in drawers and all the rarer because of it ? Next Next post: Robin Day, no bow tie.